Russia's Ambassador to the United Kingdom Alexander Yakovenko rules out the possibility of a military conflict between Russia and NATO over the Ukraine crisis. An open letter of Russia's Ambassador to the United Kingdom Alexander Yakovenko was posted on July 29 on the website of the Russian Embassy. "There are, indeed, attempts to frighten the European public opinion. But that is not true. A conventional Crimean War Two is not physically possible," Yakovenko wrote. The ambassador explained in a commentary that his letter was a response to Chatham House's June report titled Russian Challenge, whose authors recommended that the West should prepare for worsening relations with Russia and called for stepping up NATO's role as a key instrument in confrontation with Russia. "Due to defensive systems developed at the time of the Cold War and perfected over the past ten years, NATO just cannot deploy its assets close enough to engage our armed forces. In Pentagon's parlance, those weapons, never tested in real hostilities, deny access to the theatre," he said. NATO military analysts proceed from the assumption that "with the systems deployed in the Crimea we control the entire water space of the Black Sea and 40% of its airspace," the diplomat said. "You just extrapolate this on to the whole length of our western border on land and in sea, including the Baltic Sea and the Arctic, to see that no direct engagement is possible under these circumstances. It is, probably, upon this analysis, that the U.S. Administration promptly concluded that the Ukraine crisis has no military solution," Yakovenko said. "Were NATO to decide to deploy its forces beyond the range of those weapons, it would be another stupid Phoney War [a period on the Western Front during WWII between September 1939 and May 1940] with the prospect of nuclear escalation as additional paralyzing factor," he said. While the Conventional Armed Forces in Europe Treaty (CFE Treaty) "is dead because of NATO countries' intransigence," the Open Skies Treaty is "in operation and provides enough transparency for everybody to see that the said calculus is there to stay" and "cannot be changed by increased defense budgets, or by way of armor rides and WWII-type military exercises," he said. "I am sure that nobody in Europe and the U.S. is mad enough to contemplate nuclear exchanges," he said. "Britain is, too, a nuclear power. By the way, collectivization of nuclear weapons within NATO is not allowed under the NPT," he said. "We are concerned over the U.S. plans to deploy anti-missile assets in Europe as its forward defense against our nuclear deterrent. It would destroy the strategic stability, giving the U.S. an edge in case it decides to strike first. 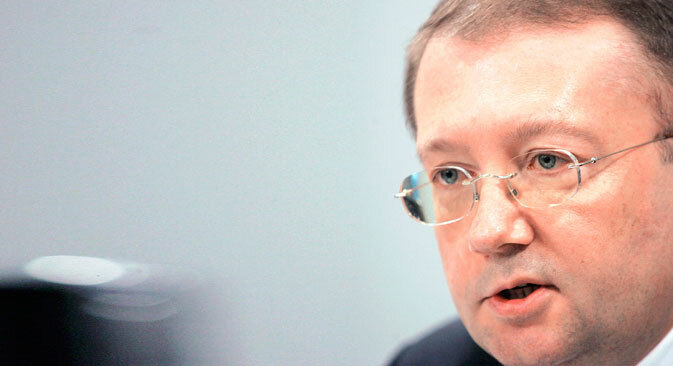 So, we have to plan for all contingencies," Yakovenko said.